If you aren?t a parent and have an interest in rushing out to see Good Boy!, try growing up. Good Boy! is a kid?s movie all the way and what?s more is also one that should have wound up going straight to video. Let?s be honest, the phrase ?starring Kevin Nealon? doesn?t exactly signify quality. After a few moments of glory behind the ?Weekend Update? desk at SNL, Nealon has been mucking around in bad comedies and bottom feeding bit parts off the sometimes questionable work of his more successful Saturday Night brethren. In Good Boy, he plays a secondary, sad-sack father role alongside another purveyor of crappy comedic travesties, Molly Shannon. Fortunately for all of us, the real stars of Good Boy are the kids? and of course the talking dogs. Yes, this is another movie about talking dogs. Last year this movie was called Cats & Dogs and featured an even wider assortment of talking pets. This time the talkers are all canines, and the excuse for their sudden vociferousness is explained by a dog arriving from outer space. No, he isn?t the latest Russian cosmonaut returning from the International Space Station. 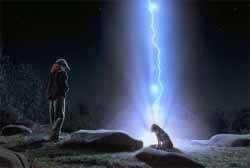 He?s a representative from Sirius, the planet all dogs originate from. Courtesy of the dime store writer concocting this thing, he lands right in the lap of Owen Baker, a dog obsessed nerd accosted by typically over the top, uber-cliché bullies who don?t seem to know it isn?t 1989. The phenomenon of Haley Joel Osment has led to higher expectations when it comes to child actors. No longer are audiences content to watch young kids stumble out words in an approximation of legitimate acting. We want the real deal. 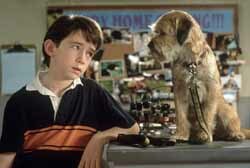 So when Owen Baker (Liam Aiken) discovers his dog can talk, well, we want to believe that he believes his dog can talk. Surprise! You will. Liam Aiken is a delightful shock. No matter how ridiculous the movie itself becomes, he stands like a rock, with an unexpectedly solid and engaging performance. Bear in mind though, that standing next to Molly Shannon is bound to make anyone?s acting seem better. Mathew Broderick picks up another voiceover paycheck, playing the voice of Owen?s space dog Hubble, whose mission here on Earth is to evaluate how Earth dogs have been running the planet. Of course when he discovers that Earth dogs aren?t actually in charge, things go horribly awry, giving Owen an opportunity to save the world?s dogs and of course give him an obligatory self-esteem boost in the process. I?m sure you?ll be surprised to hear that doggy love improves his home life too. 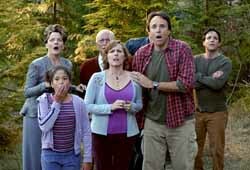 Thanks to talking space dogs, all is well in the Baker family, or as well as can be expected when your parents are played by talentless barnacles like Kevin Nealon and Molly Shannon. Good Boy! is the kind of movie best left to young children and the parents forced to see it with them. 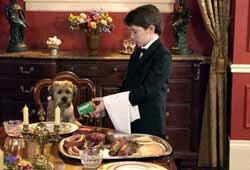 Kids will undoubtedly find value in just about any movie with talking pets. Almost certainly they?ll have a lot of fun with this one, not realizing that this very same movie has been done hundreds of times before, most often by Disney. For the rest of us, don?t let the exclamation point in its name fool you. There?s nothing exciting about Good Boy! that can?t be found somewhere else.